Why the search results contain results for multiple categories? How do I filter search results? How do I interpret search result? How does "Add More Sources" work with search results? BoolPool is a review search engine. More accurately, we bring together consumer reviews from across the web. The search that you perform might contain results in multiple categories like products, services, movies, etc. For example, if you search for "coffee" you will probably get results that contain local coffee stores, books on coffee, products like coffee makers, and Dunkin Donuts Ground Coffee. To explore more, you can either pick the results that you are interested in, or you can search again by making your search term more specific, like "coffee maker" or "Dunkin Donuts Coffee". The left panel on the Search page provides many filter options. The filter options are divided into various categories like, Products, Businesses, Movies, etc. Each category further contains list of Review Sources, that is, the web sites from where the reviews have been collected. Use input checkboxes to filter based on category, or refine it down further to list reviews only from a narrow list of websites or review sources. Helpful Tip: Click on "Filter your Search" in the left panel to expand and collapse all review categories. You can click on "Everything" in the left panel to select or unselect all filters. The image below shows a sample search result where different parts have been marked. 1. Result Details: Top left part of the search result contains result details. Details include result image, title, source site (like Amazon.com in the example above), average rating on the site, and a link to open the source site (like Amazon.com). 2. Collapse and Expand Result: The button in the top right corner of the result can be used to collapse and expand the review clusters. 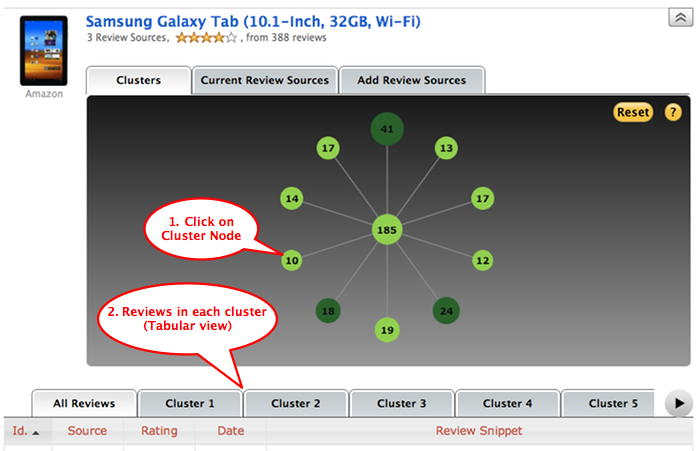 3. Review Cluster: Each node in the graph is a review cluster. Our computer algorithms group similar reviews in one cluster. Reviews are considered similar if they talk about same attributes of the products. For example, if multiple reviews talk about the "battery life" of a gadget, these reviews will be grouped together in a cluster. 4. All Reviews: The center node or the parent node contains all reviews and is the parent for all review clusters around it. This node shows the average rating of all reviews that have been grouped. Helpful Tip: Currently, BoolPool only clusters 100 reviews from any one review sources. You can however, add multiple review sources (see below) to your search results. 5. Cluster Details: Cluster Details tooltip will pop up with mouse hover over a cluster node. 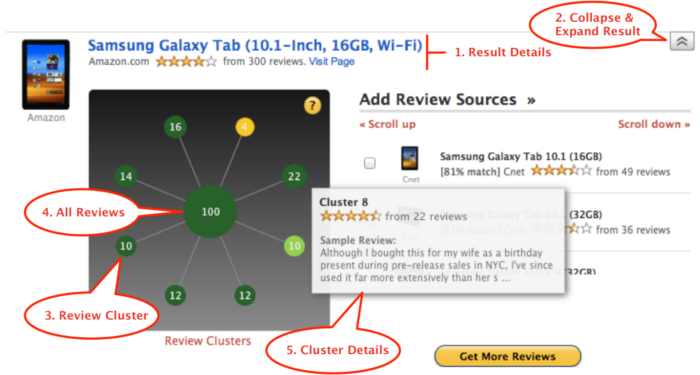 The tooltip indicates average rating and total number of reviews in the cluster. The tooltip also contains snippet of a sample review in the cluster. BoolPool provide the flexibility to add additional review sources to your search results. 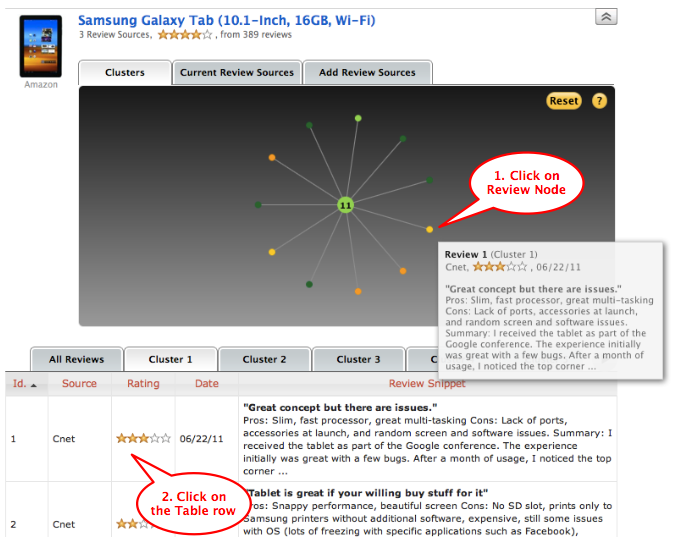 That is, you can combine reviews from multiple sites and read all clustered reviews together. In the example below, the user is interested in Samsung Galaxy Tab (10.1-Inch, 16GB, Wi-Fi) from Amazon that has 300 consumer reviews. To these reviews, the user can choose to add reviews from other sources like Cnet that also has reviews for 16GB and 32GB models. Once multiple review sources have been added, BoolPool will cluster reviews from these multiple sources and present an aggregated view to the user. 1. Similar Review Sources: This is a list of review sources that contain reviews for same or similar items. For example, if you are looking at results from Amazon then this list might contain similar results from Cnet, and other sources. This list will also contain results for similar, but not the exact same, product. For example, if your search result is 16GB, WiFi Tablet, your "Add Review Sources" list can contain results for similar products like 32GB tablets, or 16GB tablet on Verizon, AT&T and other carriers, etc. You can pick similar results that you are interested in by clicking on the checkbox next to the result. BoolPool will aggregate reviews from selected sources with reviews from your search result (16GB, WiFi tablet on Amazon in this example). Helpful Tip: Similar Review Sources list is generated using BoolPool's proprietary algorithm. Each listed source contains "[Percentage Match]" similar measure that indicates the closeness of this source with the selected result. Higher the percentage match number, more similar is the source to the search result. The percentage match number is provided to help you in selecting similar sources for additional reviews. 2. Get More Reviews: Once you have selected all similar review sources click on "Get More Reviews" button to go to the next page, the reviews page. BoolPool will collect reviews from your search result and additional selected review sources, group similar reviews together. All these reviews will then be presented to you on the next page. 3. Scroll: "Scroll Up" and "Scroll Down" links at the top of "Add Review Sources" let's you scroll up and down the similar review source list. You can also scroll through the list using your mouse wheel. How does BoolPool create review clusters? How can I see reviews in a cluster? Why are only partial reviews shown? How can I read full consumer review? What is the difference between the pictorial graph view and the tabular view? Can I sort and filter reviews in the table? BoolPool processes all consumer reviews and groups similar reviews together in a cluster. That is, a cluster contains reviews that talk about similar things like battery life of a product, or customer service of a business, etc. Processing reviews and grouping them into different clusters is a complex operation and can take a few seconds to execute. There are two ways to see reviews in a cluster. 1. Click on a cluster in the pictorial graph. This will open another pictorial graph with all reviews in that cluster, and the cluster itself in the center of the graph. 2. The tabular view at the bottom of the reviews page contains a tab for each cluster. Click on the cluster tab to see all reviews for that cluster in a tabular format. BoolPool is a review search engine. Like other search engines, BoolPool provides brief snippet of the review to help you identify the reviews of interest to you. BoolPool does not claim ownership rights to the full review, which are instead held by the websites to which BoolPool links. 1. In the pictorial graph click on a cluster to see reviews in that cluster. When you hover your mouse over a review node in the pictorial graph you will see brief snippet of this review. You can click on the review node to open a new browser window. This will take you to the review source site where you can read the full review. 2. Review tables at the bottom of the page also contain all reviews, and reviews grouped by clusters. You can click on a review to open a new browser window. This will take you to the review source site where you can read the full review. The pictorial graph view and the tabular view contain the same information. The pictorial view gives you a quick bird's eye view of how reviews are grouped into clusters and average rating of each cluster. When you click on a cluster node you will see review nodes in that cluster. This graphical view also uses colors to indicate review ratings. You can quickly see more details for the review by hovering your mouse over the review. The tabular view on the other hand lists all reviews in a cluster. You can scroll through the list to quickly browse over the reviews. Yes, reviews in the tabular view can be filtered and sorted. The left panel on the Review page provides filter options. You can filter based on review ratings and review sources. You can sort the tabular reviews by their source, rating and review date. Click on the table header to perform sorting of any column. What is BoolPool's Intellectual Property?